These are my favorite new cookies. I have made them three times because I like them so much. 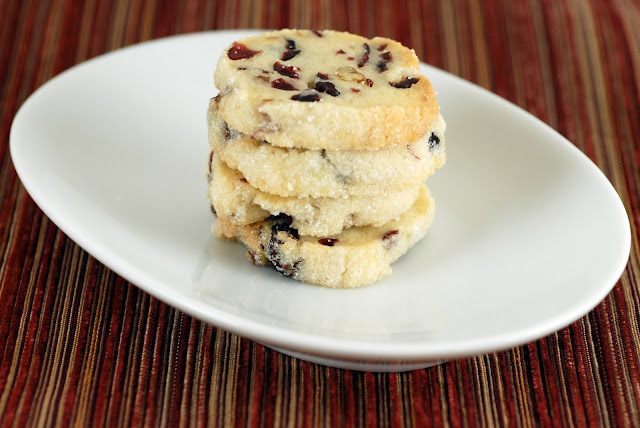 They are a perfect little afternoon cookie with a cup of tea, not that I ever sit down and have tea and cookies in the afternoon, but wouldn't that be nice? 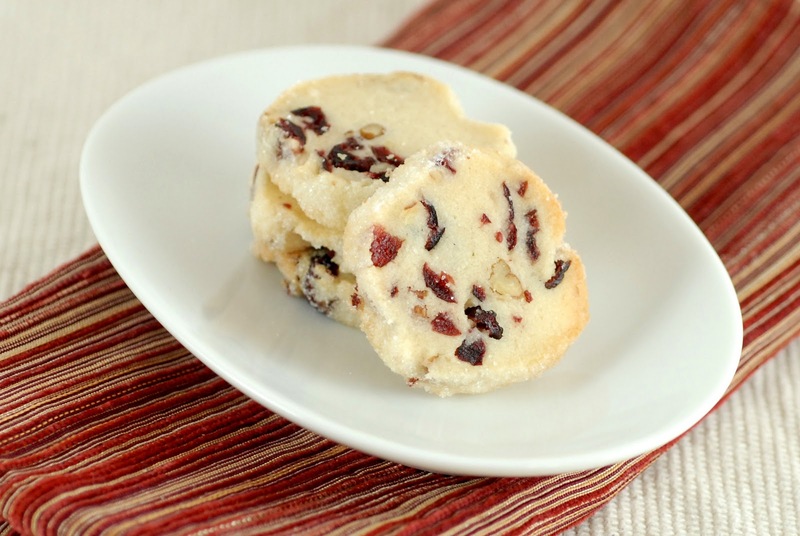 Essentially, they're a slice-and-bake shortbread cookie with dried cranberries and pecans. They are crisp and a little crumbly, not too sweet. The sugar on the edges is crunchy and balances the shortbready butteriness. 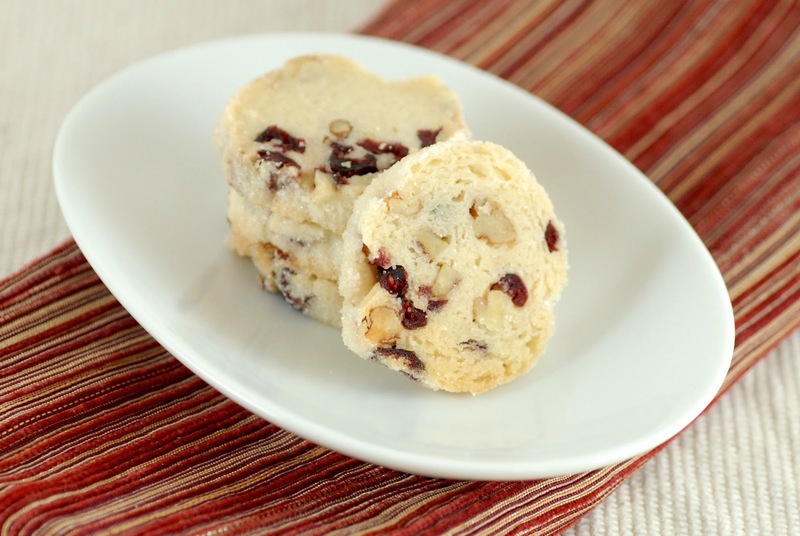 And despite my relative indifference to cookies with nuts, the pecans are perfect against the sweet-tart cranberries. I met two-thirds of The Baking Posse for dinner recently, before Nanette moved away, so I baked up a batch of these to bring along. I didn't have time to photograph them, so I wrapped the extras carefully for the freezer to take pictures later. When I searched for them, I learned that Josh had discovered them and been eating them! I actually didn't mind; he so rarely indulges in what I bake, so it's fun to make something he likes. Luckily, there were a few left for me to take pictures of. Did I mention that these are addictive? They kind of melt in your mouth. I could very easily eat three. Or six. SO good. Oh, and they travel really well! Perfect for gifts, or to take camping. You can stack them up and roll them in plastic wrap. That's the bottom of the cookie with the pecans showing. All the cranberry goodness is at the top. Unwrap one roll, and sprinkle it with a little sugar. Use the waxed paper or plastic wrap to sort of roll the cookie log around in the sugar that falls off. Keep rolling, adding a little more sugar if needed, until the log is completely rolled in sugar. (This is easier than rolling each cookie individually.) 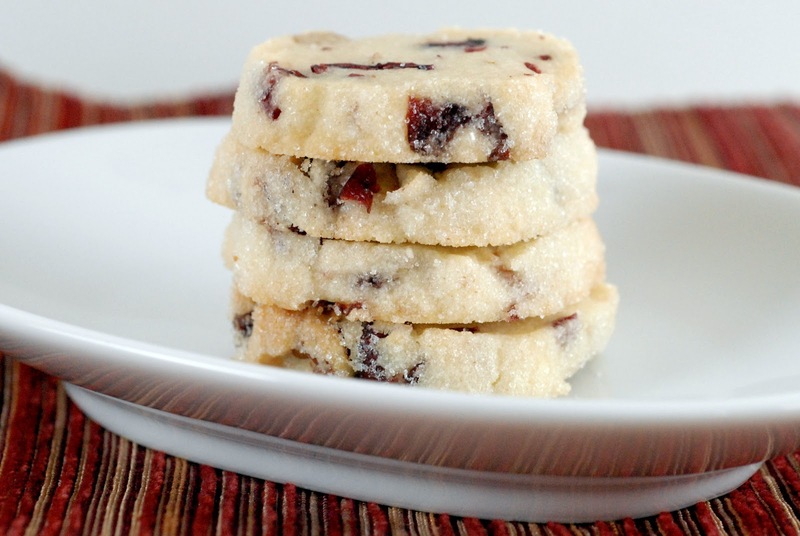 Slice cookies about 1/4" thick and place on cookie sheets lined with silpats or parchment. The cookies won't spread much, so you can place them fairly close together. Bake for 10-12 minutes, checking them after 10 minutes. Do not overbake them. They should look baked (not gooey) and have just a touch of color. You don't want them to get very brown on the edges or on top. Eat with tea, milk, coffee, or just by themselves! Consider yourself pinned! Love these photos... can't wait to give these a try! They really look very delicious. I want to try and make a batch sometime, put them in neat little transparent jars with colorful lids and ribbons --- perfect gifts! Thanks for posting! I made these last night and can confirm that they are absolutely delicious!! I stacked them up vertically and placed them in a clear cellophane bag and tied it with a cute ribbon and gave them all away (I had to -- they are way too easy to "pop" -- last count I had three in one quick sitting!). YUM Jami!! Thanks all! @Kary, glad they turned out well! @Anna, that would be super cute.